Researchers from Japan's RIKEN center discovered that skyrmions can be manipulated thermally using an electron beam. The researcher say that such a method could be used to develop low-energy memory and logic devices - in which the info is coded by the skyrmions. In ferromagnetic materials, each atom acts like a tiny bar magnet. 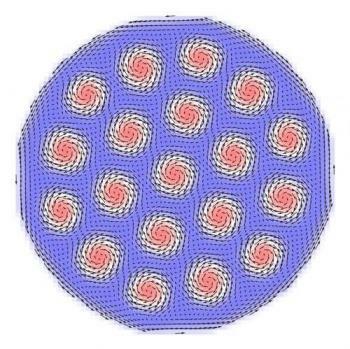 Usually all those "magnets" point in the same direction, but sometimes they can create skyrmions - "whirls" in the magnetic orientation of those atoms (see image above).